Pelose, Munson race their way to fastest NJ miles this year!!!! The whole idea of the Cherokee Night of Racing is to create an atmosphere conducive to fast times. No relays, no doubling back, no races until the sun goes down and the wind dies down. The formula worked on April 16, when Cherokee sophomores Nick Falk and Jack Shea led six runners under 9:40 in the 3,200, Falk running 9:30.52 and Shea 9:32.22. Both massive PRs. Haddonfield’s Chad Evans (9:34.79) and Cherokee’s Justin Detone (9:35.08) also posted enormous PRs that evening, and the top 11 times from that race — all under 9:44 — are still the 11-fastest times on the 2015 New Jersey performance list. The formula worked again Saturday night, with the focus on the 1,600 instead of the 3,200. Haddonfield junior Greg Pelose and Timber Creek senior Dominick Munson ran the two-fastest times in the state so far this year, Pelose edging Munson 4:17.41 to 4:17.78. Eastern junior Nick Pschunder (4:19.73), Haddon Twp.’s Jake Dinerman (4:23.07), Cherokee’s Falk (4:24.42) and Haddonfield soph Austin Stoner (4:25.16) now form the rest of the top of the 2015 New Jersey performance list. Munson led the pack through 800 meters in 2:09.51, with Pelose (2:09.71) and Stoner (2:09.92) next. Coming through 1,200 meters, Munson was at 3:13.1 and Pelose 3:13.3, with Stoner at 3:15.9. Pelose closed in 64.2 and Munson in 63.6. Pschunder actually closed the fastest, splitting 61.9 on his final lap. New Jersey’s bizarre and ridiculous obsession with an endless ledger of relay meets for the first half of the season means most runners don’t get to run fast open times early. They’re either being hammered with dual meet after dual meet or running sprint medleys, 4-by-8s and DMRs throughout April and the first half of May. The Cherokee Night of Distance is a way for coaches who care to get their kids good competition, a well-organized event and a chance at an early fast time. Munson’s 4:17.41 is not far from his PR of 4:16.56, which he set at Group 3 states last spring. But Pelose’s 4:17.78 was a big PR from his 4:22.26, which he last spring on the same day Munson ran his. Munson raced that day at Egg Harbor, Pelose in the South Jersey Group 2 meet at Buena. Pelose is the seventh Haddonfield runner — just since 2010 — to run sub-4:22. Six of them have broken 4:20. That’s crazy! Lenape becomes first S.J. 4×4 to break 3:50 at Penn in 12 years!!! Lenape with coach Gerald Richardson. Running sub-3:50 at any point in the season is crazy fast. Doing it in April is almost unheard of. The Lenape girls became the first South Jersey 1,600-meter relay team in 12 years to break 3:50 at Penn Saturday with their 3:49.97 for third place in the Philadelphia Large-School Championship race at the 121st annual Penn Relays at Franklin Field. Sophomore Jasmine Staten got Lenape into the race with a brilliant 56.7 leadoff leg, an Marissa Topolski (58.6), Shannon Storms (58.5) and Carly Pettipaw (56.4) followed as Lenape finished behind only Newmann-Goretti of Philly (3:47.39) and Cheltenham (3:47.67). Lenape qualified for the Large-School race with its 3:59.53 win in the South Jersey Championship race Thursday. The last South Jersey school to dip under 3:50 at Penn was Willingboro in 2003. The Chimeras won the South Jersey Large-School race in 3:47.30 and qualified for the Championship of America but scratched because of an injury. Lenape was also under 3:50 with its 3:48.78 for third at the Meet of Champions. Only Willingboro, Camden and Lenape in South Jersey track history have gone under 3:50 in consecutive years. Their 3:49.97 is No. 32 nationally. Willingboro has been under 3:50 eight years, Camden four, Wilson and Lenape twice, and Eastern, Penns Grove, Winslow Township and Washington Township once each. 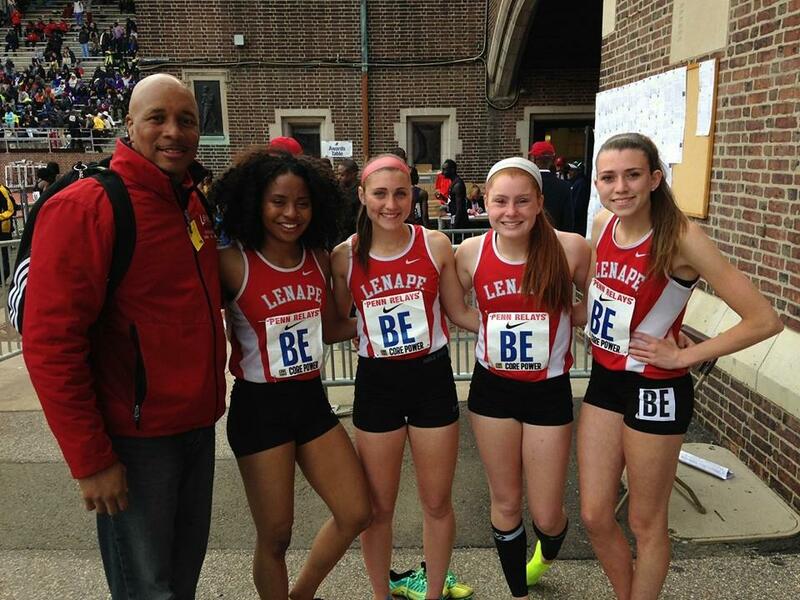 Lenape also ran 49.57 at Penn, 19th-fastest of 248 schools that ran the 4-by-1. Ariel Mitchell, Jasmine Staten, Marissa Topolski and Sam Maynes ran on the 4-by-1. And they ran 12:16.79 for seventh in the DMR, with Camille Franklin, Staten, Pettipaw and Megan Quimby. What a weekend for coaches Gerald Richardson and Jack Walsh and the Lady Indians!!! Chris Mirabelli, a former Meet of Champs winner for Holy Cross, placed third in the Penn Relays college javelin Saturday, throwing 227-5. That’s just 21 inches off his PR of 229-2, set last weekend at the Larry Ellis Invitational at Princeton University. Mirabelli, a Rutgers freshman, is ranked No. 23 in NCAA Division 1 and No. 9 in the East Regional. Mirabelli finished behind only Robert Smutsky of William and Mary, who won with a 235-1, and teammate Josh Suttmeier, who threw 231-10. Suttmeier, a South Carolina transfer, attended North Hunterdon High School. Suttmeier was ninth in the 2012 NCAA championships, earning All-America honors. Mirabelli’s high school PR was 216-6 at last year’s South Jersey Open at Buena. That’s No. 4 in state history with the new javelin. Mirabelli is the No. 4 freshman in Division 1, behind Ioannis Kyriazis of Texas A&M (248-6), Brad Stevens of Washington State (233-2) and Michael Criticos of Memphis (230-5). The No. 5 freshman in Division 1 is Curtis Thompson of Mississippi State, who threw 224-7 at the Crimson Side Invitational last month. Thompson, a Florence graduate, and Mirabelli are the last two New Jersey Meet of Champions winners. Thompson had a high school PR of 224-10, set at last year’s Meet of Champions. Rancocas Valley runs 42.85 to advance at Penn Relays!!! After a disappointing 3,200-meter relay, Rancocas Valley bounced back Friday with a terrific performance Friday in the 400-meter relay at Penn. RV’s 3,200-meter relay team ran without star Isaiah Curbelo and not surprisingly didn’t come close to the 8:03.47 it ran at Woodbury. But the Red Devils’ 400-meter relay team made sure R.V. 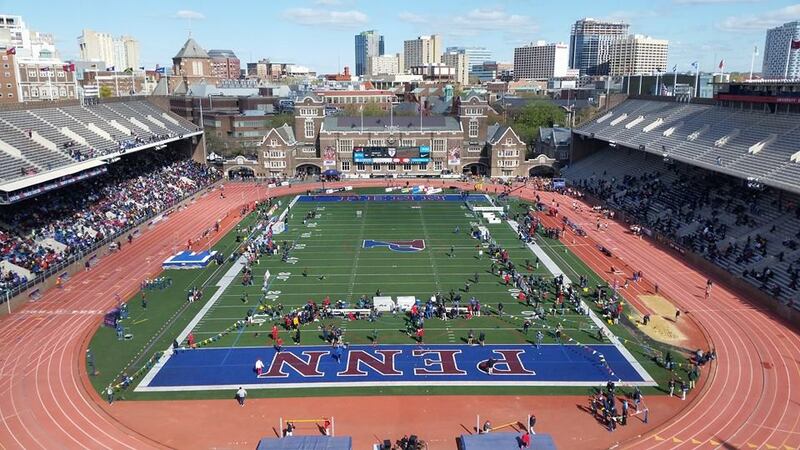 didn’t leave the 121st annual Penn Relays at Franklin Field without something. In cold, windy conditions, the team of JeSean Foster, Dyson Scott, Shaun Ellis-Bradley and Sterling Pierce ran 42.85 and advanced to Saturday’s Large School Championship race. Foster, Scott, Ellis-Bradley and Pierce ran the ninth-fastest time of 257 teams that raced and the fastest of all New Jersey teams. They were also sixth-fastest among U.S. teams. Full results of all the 4-by-100s at Penn are here. R.V., running in the 18th heat, beat second-place Mount St. Joseph of Baltimore (43.75) by almost a second. 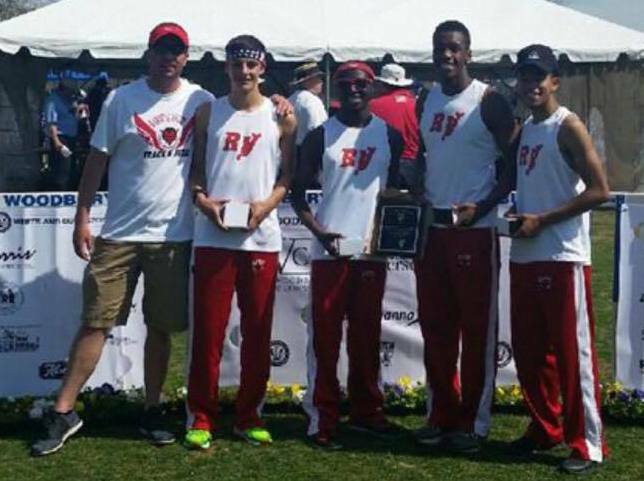 Rancocas Valley also ran nearly a second faster than the next-fastest New Jersey school — Pennsauken, which ran 43.68. The Large-School race is scheduled for 1:55 p.m. Saturday. Heat sheet for the race can be found here. Rancocas Valley is No. 1 in New Jersey with its 42.49 on the fast track at Woodbury, and with good conditions, this fast field and good stick work should be able to trim some fractions off that time. The Large-School Championship race is open to the eight-fastest large high schools that didn’t qualify for the Championship of America. R.V. has the fourth-fastest qualifying time behind Reggie Jackson alma mater Cheltenham, Pa., of Montgomery County (42.47), C.H. Flowers of Springdale, Md., (42.71) and Bowie (42.82), also of Maryland. Also in the field are Wolmer Boys of Kingston, Jamaica (42.88), Wise of Upper Marlboro, Md., (42.99), Jamaica College of Kingston (43.09) and Upper Darby, Pa., of Delaware County (43.10). From Lane 2 out to 9, it will be Upper Darby, Jamaica College, Wise, Wolmer, Cheltenham, Flowers, Bowie and R.V. Lenape overcomes cold, windy conditions to win Penn SJ 4-by-4!!! They didn’t just win the South Jersey 4-by-4. They crushed it. The Lenape girls won their second consecutive South Jersey Large-School 1,600-Meter Relay Thursday at the 121st annual Penn Relays at Franklin Field. The team of Carly Pettipaw (59.7), Jasmine Staten (59.2), Shannon Storms (60.8) and Marissa Topolski (60.0) combined to run 3:59.53 and beat second-place Winslow by 18 meters. Winslow Township was second in 4:09.93, and Lenape’s 10.4-second margin of victory is largest in at least 20 years in the South Jersey relay. The largest previous margin of victory since 1996 is Willingboro’s 8.36-second win over Washington Township in 1999, 3:48.80 to 3:57.16. Full results before 1995 are not available. Here are all the winning times from the South Jersey Large-School race. There was one South Jersey race up until 2005, when it was split into Large School and Small School. Lenape’s time was 24th-fastest Thursday from among 624 schools in the various 4-by-4 sections at Penn and third-fastest among 199 New Jersey schools, behind only Columbia (3:49.64) and Union Catholic (3:57.48). Click here for a ranking of every 4-by-4 performance at Penn. This is the sixth time in the last nine years that Lenape has broken four minutes at some point during the spring season. Here’s a look at Lenape’s fastest 4-by-4 time every year since 2007, with their South Jersey ranking in parentheses. The Indians have been one of South Jersey’s seven-fastest 1,600 relay teams seven of the last nine years. Williamstown blazes to N.J. #1 1:27.92 at Woodbury!!!!! What a 4-by-200 performance by Williamstown Saturday at Woodbury! The team of Michael Choates, Jean-Paul Roane, Raekwon Martin and Cameron Dobbins ran the No. 1 time in New Jersey this year, shattered the Woodbury Relays all-groups record and broke the Gloucester County record with a time of 1:27.92. The Braves edged Rancocas Valley, the alma mater of Williamstown coach Dwayne Dobbins, who ran 1:28.23. They are the two-fastset 4-by-200 times in Woodbury Relays history. The previous meet record was a shared 1:28.35 by Timber Creek in Group 3 in 2014 and 1:28.2 hand-timed by Winslow Township in 2008. The previous Gloucester County record was Delsea’s 1:28.62 at the 2010 Carl Lewis Invitational in Willingboro. Williamstown’s time is No. 13 in South Jersey history, and R.V’s second-place time is No. 16 in South Jersey history. The Group 4 race was ridiculously fast top to bottom Saturday, with Egg Harbor (1:29.74) also breaking 1:30, and Vineland (1:30.48) and Kingsway (1:31.95) also under 1:32. Those times rank No. 1, 2, 3, 8 and 16 in New Jersey this year. In all, Woodbury produced the 23-fastest 800-meter relay times in New Jersey so far this year. Rancocas Valley runs fastest Woodbury DMR in 39 Years!!!!!! Back in 1976, Toms River South ran 10:24.48 to win the Group 4 distance medley at the Woodbury Relays. That was 39 years ago. That performance has stood as the meet record for nearly four decades, and it will continue to be, but it now has some company. Isaiah Curbelo’s 4:19.3 anchor led Rancocas Valley’s DMR team to a FAT meet-record 10:20.92 on Saturday, which converts to slightly slower than T.R. South’s performance over 2.5 miles but will be listed alongside that 1976 race as a co-record since it was run at 4,000 meters. Jose Colon-Cruz led off for R.V. with a 3:11.8 for 1,200 meters, followed by Mario Ramos 51.9 for the 400 and a 1:58.1 by Josh DeJesus to set up Curbelo. This is the second time in the last three years R.V. has won the Woodbury Group 4 DMR. Colon-Cruz, Anthony Adams, Joel Straker and Curbelo won in 10:42.82 in 2013. The 10:20.92 is a school record by exactly nine seconds, breaking the hand-timed yards mark of 10:34.1, which converts to 10:29.92 for 4,000 meters. RV also ran 1:28.23 for second to Williamstown in the 4-by-2 at Woodbury Saturday. That’s No. 2 on the all-time Burlington County list, behind Willingboro in 2007 (1:27.75 at Nationals). The 1979 Chimeras ran 1:28.0 hand-timed in 1979, which converts to slightly slowly than R.V.’s time. Pending other results from around the state Saturday, Rancocas Valley’s DMR time is No. 1 in New Jersey this year and the 4-by-2 is No. 2.